In a bowl, whisk together the flour, baking powder, salt and nutmeg; set aside. With an electric mixer, cream the butter and brown sugar together until smooth; about 4 minutes. Add the eggs, vanilla extract and honey and beat until smooth. With the mixer on a low speed, slowly stir in the flour mixture until combined. Add the milk and stir until incorporated. Bake at 350°F for 15-16 minutes. Frosting: Beat cream cheese, butter and vanilla in large bowl with mixer until well blended. Add powdered sugar gradually, beating after each addition until well blended. Use to frost cupcakes. You can also freeze the batter for future use. 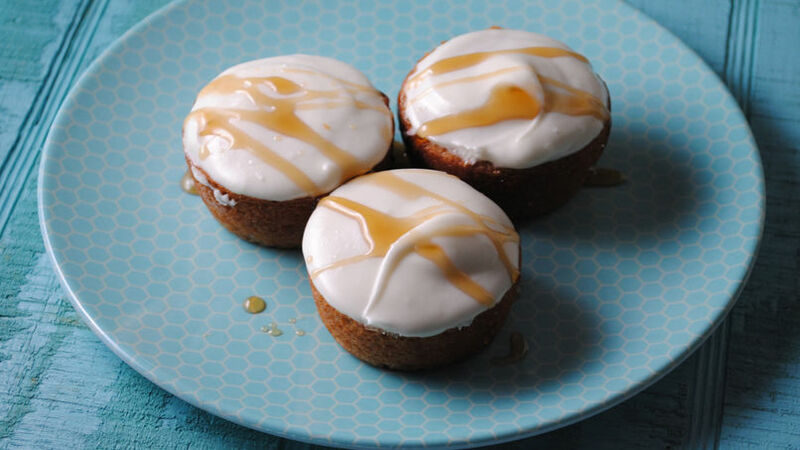 Sweeten up the week by baking up a batch of these delicate honey cupcakes. The batter is infused with a touch of honey and a sprinkle of nutmeg, giving these cupcakes a taste of fall. Topped with cream cheese frosting and drizzled with honey these cupcakes are sure to be a hit! Double the recipe and enjoy throughout the week, but make sure to save one for yourself to enjoy with your afternoon coffee.